I picked up this book because I’ve heard of Chesterton, of course, and because I’m a big fan of the Bill Murray film The Man Who Knew Too Little. So this book is a two-fer: An intro to Chesterton and the knowledge of the source of the trope. It had been facing out of my hallway to-read bookshelves for a while, and I picked it up, hoping to get through a collection of short stories quickly. Oh, but no. This volume collects eight connected short stories. Horne Fisher is a member of a well-connected British family whose members include several high-ranking government officials. Horne is the odd duck of the family, a dilettante that knows a lot of things and a lot of things about people. In each of the stories, someone gets murdered, and Fisher gets to the bottom of it, but the murderer goes free for the greater good of the country somewhow. Fisher has a confidante in journalist Harold Marsh who hears the crime solutions but also does not take action at his friend’s behest. The style is a bit stilted, a bit more targeted perhaps to the aristocracy or to the intelligentsia than, say Rudyard Kipling or popular translations of Jules Verne. So I found it slower to read and easier to put down, which is why it took me a while to read the whole book even though it’s only 160 pages. I’d read something else in the interim and then a story in this book. This approach kept it from becoming too tedious. At any rate, perhaps not the best lead into Chesterton’s work. Less approachable than Christie, and given that the criminals do not receive justice, unsatisfying. I was probably hindered by not knowing the exact period in which this was going on nor the conflicts alluded to. Even watching the entirety of Downton Abbey did not prepare me adequately. And I couldn’t hear Michelle Dockery’s voice reading it aloud (unlike Cotsold Mistress, where my imagining it helped me get through the book). Still, I can say I’ve read some Chesterton now, which probably makes it worth the fifty cents or dollar I paid for the book. You can find fairly inexpensive editions on Amazon as noted below. I bought this book on Friday, and in that very post I pointed out the lack of recent book reporting. So I grabbed one of the thin, browseable books from that stack and flipped through it even though it’s a bye week for the Green Bay Packers. This book collects a number of little letters as though they were written by pets to God. There must be some sort of cutesy collection of children doing this sort of thing for this collection to piggyback on, but I’ve avoided it. Probably for similar reasons that I like jokes with talking dogs but not talking children. Which was true even before I had children of my own. At any rate, the book is about what you expect: something along the lines of I Could Pee On This and with about the same amusement factor. Which is to say some things were amusing, most were not, and I didn’t get dumber reading it. So worth your time if you’re me. Or if this is your bag, baby. Interesting note: The author’s bio indicates he is the former editor of Pets: Part of the Family, Prevention, and Men’s Health magazines. Actually, that’s all the bio. One would think a former editor would have weightier things to write about, but I guess not. Or this fills the time and the bank account. Maybe he’s a professional. Unlike your humble host, who mostly writes this as a gift to myself in four years, when I’ll page through these posts and find them amusing in an I Could Pee On This way. If, in four years, I can still access this site given I’m not sure how to convert it to https. Friday closed out the semi-annual book sale season here in the Springfield area. 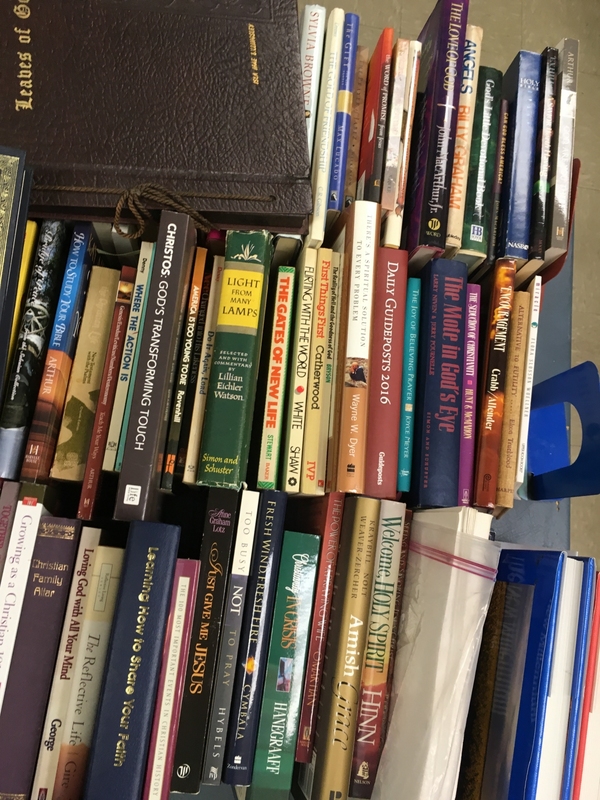 The trifecta of the Friends of the Christian County, the Springfield-Greene County, and Clever Library(ies) provide the basic three book sales we hit in the spring and the fall. Things like the Lebanon-Laclede County or Polk County libraries, an hour away, are the outliers. This season, like so many, we hit all three, with the trip down to the Clever fire station closing it out. It’s the smallest of the three sales, but I managed to find a couple things. Teachers Jokes, Quotes, and Anecdotes, something put together to be a gift to a teacher but something I’ll flip through while watching a football game. The Essential Kabbalah, a book on the Jewish mystical tradition. 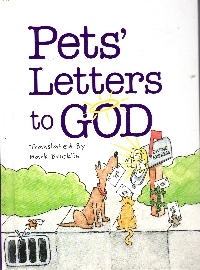 Pets’ Letters to God, a Hallmark humor thing, also for flipping through during football games. Assumed Identity by David Morrell. I’ve read First Blood and Rambo: First Blood Part II and have since collected a couple more by this author, but I’ve yet to read them. But by adding more to my to-read shelves, I’m adding to the statistical chances that I’ll actually pick one up. A Catholic Guide to the Bible by Father Oscar Lukefahr. I’m currently working my way through the Orthodox Study Bible, which is the like the Director’s Cut of the Christian Bible, and this book should give me a traditional Catholic perspective on it. The sale had many books by Father Lukefahr, but I only bought this one. Awkward Family Pet Photos, something to flip through during football games probably based on the Internet site. The Life of Greece by Will Durant. I’m creeping up on a set of his Story of Civilization books. Someday. Mythopoeikon, a collection of paintings, etchings, book jacket, and record sleeve covers by artist Patrick Woodroffe. I’ve never heard of him. Perhaps I’ll recognize something as I flip through the book during football games. Some three or four years from now, probably. Making Bead and Wire Jewelry by Dawn Cusick. Remember those days long ago when I did stuff like this? My book buying remembers. Wisconsin: A Picture Memory with text by Bill Harris. The pictures probably won’t align with my memories, but will kind of rhyme. Not purchased: Any of the John Sandford Prey novels I might lack; the Tibetan Book of the Dead; a book on competitive running. I also picked up a couple of DVDs: A four pack of WWII movies including Tora! Tora! Tora! because I’ve seen it memed a bit lately, but mostly because it includes Von Ryan’s Express which I bought during my eBay listing days and sometimes use as test data for this Web site I test. As part of my testing, I learned Frank Sinatra was in the film version, which I now own. 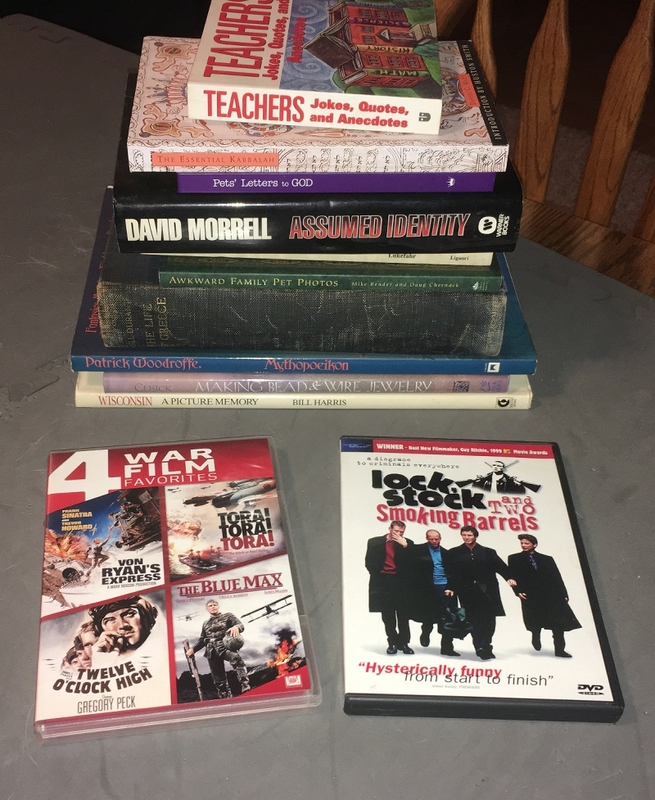 I also got Lock, Stock, and Two Smoking Barrels because, well, in my recent Jason Statham film watching, I was going to quip on Facebook that I’d even watch Lock, Stock, and Two Smoking Barrels if Jason Statham was in it, and lo! He actually is. So I will have to watch it. At any rate, with a couple of books for the children and, I presume, something for my beautiful wife (although I’m not sure where they went), we spent several sawbucks, but the Clever Library needs all the friends it can get. So I should probably sit down and read some books here soon. It’s been a while since you’ve seen a book report, ainna? So I was listening to an old Dan Seals album (actually, it was The Best, so it’s less old than Won’t Be Blue, an LP we won on the country radio station when I was young and spun over and over in our trailer park days), and I came across his song “My Old Yellow Car”. Here it is presented with a slideshow of someone’s old yellow Mustang. You know, I have a car in my history for which I feel a little affection. Strangely enough, it is not my own Mustang, my third car. A 1984 GT with eight cylinders with high mileage that I bought in a hurry after my second car was totaled when someone sneezed on it (well, rear ended it and pushed me into another car). I pumped a lot of money into that Mustang, replacing lots of parts on it and hoping to have a nearly new Mustang at the end of it, but a transmission failure that laid it up for over a month led me to buy a newer car after renting cars for weeks. I liked the Mustang, but I never got the hang of smoothly starting the car in the cold, and I only drove it for five months in the winter and spring before getting my fourth car. No, the one I feel affection for was my first car (of course), a 1986 Nissan Pulsar with four cylinders, a manual transmission, a moon roof, and a cassette deck. I bought it with my college graduation money, when returning to House Springs, Missouri, meant I would need a car where buses would did in Milwaukee. I said I wouldn’t learn to drive a manual transmission unless I bought a sports car, but there it was. A friend of the family, a shade tree mechanic, gave me a half hour’s lesson in driving a manual transmission, and I was off (except in this case, “off” often meant “popping the clutch at a stoplight on the highway”). I mean, the car was nothing special. It didn’t have much horsepower, although with the manual transmission, I could accelerate pretty quickly and beat other cars off the line, especially when they did not know we were racing. The car itself was red, but it was not shiny; the clear coat was mostly peeled off, which meant it was a dusky, dull red. I don’t think I have a picture of it anywhere. I hoped to get it painted, but a couple hundred dollars for a cheap paint job was out of my reach in those early English Degree job days. It was my first taste of post-collegiate, can-go-anywhere freedom. I drove it an hour to and from work(s), an hour to and from coffeehouses, and up and back to Milwaukee and Chicago on multiple occasions. I picked up my first girlfriend in that car, and I roamed the back roads of my corner of Jefferson County, learning where I could coast in neutral for miles down the hills that pale compared to the Ozarks. Alas, the car was not as good to me: It had a short somewhere, and it went through numerous headlights, batteries, and alternators which the shade tree mechanic mentioned above would replace without looking for the underlying cause. It left me stranded on the side of the road many times, and when it did so again in a parking lot on Manchester Road, I left it and got car number two (later to be totaled, as mentioned above). The car sat in the back yard of the house where my mother and I lived (and later the shanty of a garage the house had) for years so I could–someday–hunt down the short and repair it. Spoiler alert: I never did, and I eventually donated the car to the cancer society. But the car is tied to that first bit of youthful freedom, so somewhere in my heart I’m still driving it, listening to a worn Lillian Axe cassette, and smelling a summer breeze full of possibilities. I’ve built a time machine powered by a glowing meteorite that fell into my back yard. It’s only enough power for one trip back in time, so I’m either going to kill Hitler or stop Paul Granders from releasing that annoying song “Bigger Smiles” that swept the Internet and then real life when people make that obnoxious “Bigger Smile” gesture. For Pete’s sake, every last contestant on this season of American Ninja Warrior made that stupid sign at the starting line, probably in partnership with the Bigger Smiles for Dental Hygiene Awareness Foundation. At any rate, I’m not decided yet, but by the time you read this, I will have made our present a better place, I hope. UPDATE: Mission accomplished! Thank goodness! Hey, wait a minute. What’s with this heart shape made with your hands nonsense? Dammit! As I mentioned, I bought a Spyro Gyra album on Friday after having heard a Spyro Gyra song on WSIE in the last couple of weeks. I was surprised, actually, that it was a pleasant, smooth jazz song that I heard on the radio. The album is, too. Apparently, Spyro Gyra is a jazz fusion group, and that caught me by surprise. You see, I thought Spyro Gyra did zydeco, the accordion-heavy Cajun music style. Why, you ask? I sure did. The best I can figure is that Spyro Gyra played Summerfest a lot in the early days and on the same stages as a band called Buckwheat Zydeco. So I tainted Spyro Gyra by association. And one fits my record album tastes. You know, there was a time when I was excited for the new season of Sesame Street because I was eager to see new material. But that was a long time ago. Not as long as Summerfest, though. At any rate, I am pleased with my album pick up and will look for more Spyro Gyra in the future. Well, all right, not necessarily a true history lesson, but certainly a history lesson steeped in legend. My youngest has a problem with his shoes, namely the tying thereof. As he walks around with untied shoelaces, he pulls them out of the eyelets of the shoes so that he often has both ends of the lace on the same side of the tongue, which means he cannot effectively tie them anyway. Of course, the aglets have been worn away through misuse-namely, the not-tying. I helpfully agreed, but the knot was too tight for me to quickly untangle without tweezers. So I decided on a history lesson instead. He took out his sword and cut the knot,” I said, and I took out my pocket knife and cut the lace just below the knot. He might actually remember this story then. But I hope the test on the famous almost-Greeks of the B.C. era comes soon in his fourth grade class. Because it’s entirely possible the only thing he’ll remember is that his father carries a pocket knife. Because he’s certainly not going to remember to tie his shoes. So for a couple of weeks, we marveled at the beautiful spider webs woven between my truck’s driver-side mirror and the ground. Some spider was working overtime to rebuild it after windy days or days where I inconveniently drove my truck somewhere, tearing the delicate hunting ground. I mused that the spider must be living in the mirror assembly, as it was unlikely that the creature would climb up my tires, through my suspension and body, to the mirror every day. Instead, after building the spider would retreat to its lair and then emerge again to drop down its initial lines and crawl back up to spin the web. On my recent trip to Kansas, this was confirmed as the spider started rebuilding its web in the parking lot of the restaurant where I’d had dinner. I took a few snapshots, climbed in, and drove off, presumably with the spider still dangling from its line. Along the road to my hotel, it blew off somewhere into the wilds of Leavenworth. Last seen headed southwest, towards Chez Venom. 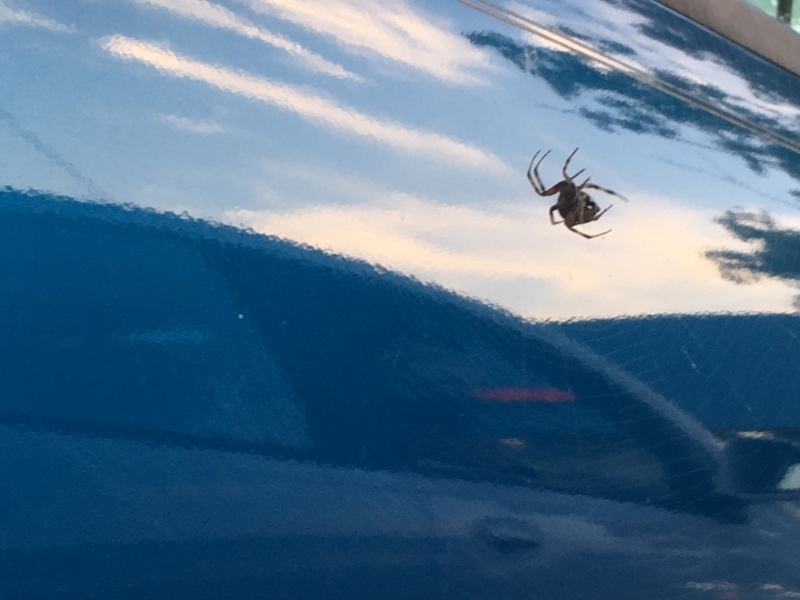 The spider did actually blow off outside my vehicle and did not blow into the truck. Otherwise, every time I clamber into the vehicle in the coming months, I will sit in a spider web beneath a grudge-holding spider. That the spider’s species habitat already included Kansas. Otherwise, I might have introduced an invasive species into the habitat, which could bring some sort of ecological apocalypse on the Sunflower State. Worse, I might be subject to some sort of government sanction under some obscure administrative rule. A certain kind of person often thinks about government regulations that one can inadvertently break and ruin one’s life with. I’m special. The restaurant was an Applebee’s (since it shares a parking lot with the used book store. Do you think the spider saw that and thought, “Yayus! Bees that taste like apples!”? You could probably have guessed after I bought a couple books while out of town for the night that I’d pick up the shortest book to read in my hotel. And you would be right. As I mentioned, I saw this play in college. Ah, my senior year: I saw a large number of plays with a number of comely young ladies, none of whom was interested in me. Well, maybe a couple were and I was oblivious to it. I had to attend this play for one of my classes, and I sat next to a young lady who I knew from the writer’s club. After the play, we walked out together, and she straightened my tie. Did that indicate interest? I don’t know. When reading others’ emotions and acting upon them, I’m a chimp at the space shuttle controls: I know something’s happening, and I know I should do something, but I just press the wrong buttons. At any rate, I remember the play not only because of the young lady but also because the play disturbed me a bit. It’s told from the point of view of an English student reminiscing about his family life and his parents’ marriage which ends while he’s at school. I, of course, had studied a bit of Thomas Hardy at the time (one of the devices of the play is that the narrator talks about analyzing Hardy’s works as he’s analyzing his parents and perhaps their influence upon him). As the child of a broken home (relatively fresh at that, what, with their marriage still longer than the period they’d been divorced), I felt for the kid. Who was older than I was at the time. So I saw the book, and I remembered almost viscerally the reaction I had to the play at the time, so I bought it and read it again. As an adult (older than my parents when they divorced and almost as old as my father was when he died), I don’t get quite the poignancy that I did then when I identified with the lad, but I do still have a bit of sadness for the characters in the play. I think it’s billed as a comedy, but it’s more a tragedy than a comedy. Even though the moments from the play stuck with me–I’d forgotten a part where a priest imitates bacon, but when I got to it in the book, I immediately remembered the scene on stage. So it’s a good play, all right. The edition I have has a lot of end notes from the playwright (who played the main character in the big New York production of it in the middle 1980s) giving a lot of direction for the direction of the play, including some interpretations that he did not care for in some productions. I’ll be honest, that’s a bit of cheating: In my playwrighting class, the professor said to put all that in the words and stage directions, and to put only the bare minimum in to allow for as much interpretation as you can stand. So the end piece seems a little uncricket. Also, this book is again a book club edition. Which means our parents or grandparents liked plays enough to buy them from a book club. I cannot even imagine that. There aren’t that many people who buy plays these days (or maybe it’s just me), but I don’t remember seeing many of them in the book stores or book sales I frequent–I know, as I buy them. That’s a shame, as they’re often nice, quick reads with impact beyond their word count. I managed to make it home safely from Leavenworth, and I had a moment to visit the Friends of the Springfield-Greene County Library Book Sale way up north. And by “had a moment,” I meant that I passed the venue in the morning on the way home and I COULD NOT REST until I got a chance to return. So I suckered my beautiful wife into an afternoon excursion by dangling before her a lunch at her favorite Italian restaurant first. As you know, gentle reader, when it comes to the FSGCL book sale (I’ve got a government contract, a GC, so know everything is abbreviations, EIA), I like to visit the albums one day and then maybe the more expensive books on half price day. Well, I visited the albums, and then I went to look for my beautiful wife in the better books section. Where a couple of books fell upon me and waylaid me and kidnapped me to the register. The Foxfire Book 2 and The Foxfire Book 3–there were sets of the first three, and I picked the better copies of the last two. Which will come to bite me here in a couple of minutes when I discover I already own 2 and lack 1. The Te of Piglet, which I have been looking for since I read The Tao of Pooh last year. Plain Secrets: An Outsider Among The Amish which I expect to be more on that topic than Plain and Simple: A Woman’s Journey to the Amish. I put down another Amish-themed book because it was a small press book called something like The Secrets of the X Amish and looked to be simple agitprop. Praetorius Christmas Music/Schein Two Suites from “Banchetto Musicale”–I pretty much buy anything in a Nonesuch sleeve. Better Days/Happy Ending by Melissa Manchester. I’m not sure if I like her or not or will like her or will not. I’ll take a chance for a buck. Born Late by Shaun Cassidy. Because I work with a project manager by that name, and I’m going to ask him to sign it for me. Sentimental Journey by Boots Randolph. A flute album by Tim Weisberg. Hey, it has “Nights in White Satin” on it. On the flute, presumably. Ellington Fantasy by the Hugo Montenegro Orchestra. The guys who did the music for Eastwood’s The Man With No Name movies and Hang ‘Em High. Make It Easy On Yourself by Burt Bacharach. Strangely, there were three copies of this album in the thin selection of LPs. All Time Greatest Hits by the Commodores. M.F. Horn Two by Maynard Ferguson because the cover is cherry, and the platter might be in better shape than the copy we already own. Jackie Gleason Presents Aphrodosia. Which is what you put on after you play Jackie Gleason Presents Music To Changer Her Mind and before Jackie Gleason Presents Oooo! Homer Louis Randolph, III. Spoiler alert: It’s Boots. Kenny G by, well, Kenner Louis Grandolph, III, perhaps. Music for Daydreaming by The Melachrino Orchestra. I only buy the Music for series by this orchestra. So far. By Request by Perro Como. Perry Como Sings Merry Christmas Music. I already own a copy with the more common cover (review by yours truly in 2014). I mean, I bought a variant cover and a duplicate LP with a better cover, but I’m still not a collector. Just an accumulator who likes prettier accumulations. Also note that my beautiful wife bought a single LP, so when she mentions that we don’t have a good storage system for our records, IT’S HER FAULT. So I had to drive up to Leavenworth on business yesterday (the actual drive time: 8 hours round trip; the actual time spent on the business: 15 minutes). Instead of turning around in the late afternoon and returning home right away, I booked a room for the night. Which meant I had a little time to kill before hitting the bed. When alone in a strange town, what do you think I do? I’m not actually sure what the book store’s name is. On the map, it’s Book Exchange, and as the photo indicates, there’s a little metal sign indicating the parking in front of the store. However, bigger signs say Half Priced Books. So the name is one or the other. It’s right next to a martial arts school, and while I was browsing the books, I could hear the classes going on. Not just the sensei; I heard the students’ responses. At any rate, I picked up a couple things mostly to be polite. 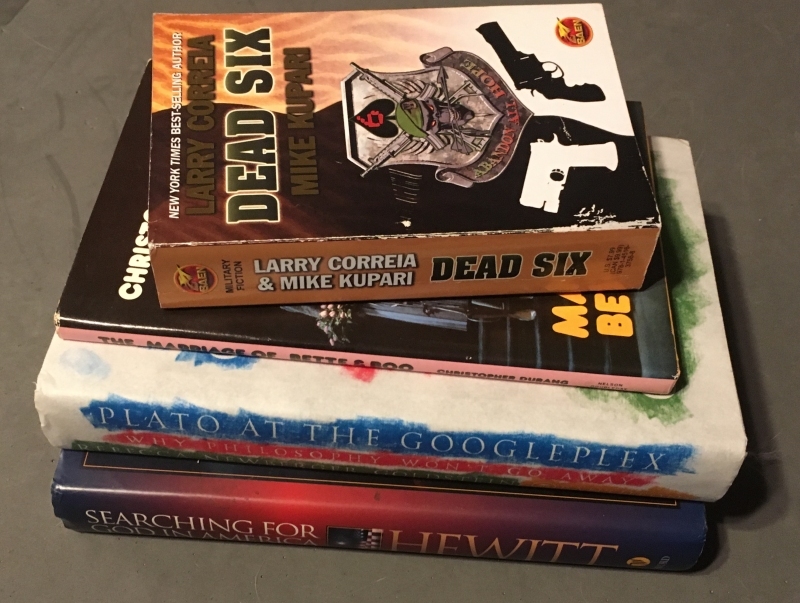 Dead Six by Larry Correia and that other guy. 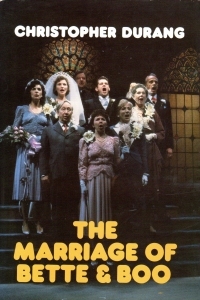 A play I saw in college, The Marriage of Bette and Boo. Plato at the Googleplex, which I’ve seen in the library and thought about reading. Of course, with so many books on my to-read shelves, I couldn’t make time to read it as a library book. I HAVE SOLVED THE PROBLEM. Searching for God in America by Hugh Hewitt. This looks to be a companion book to a television series. I already purchased a companion book to a television series about religion this fall (Charlton Heston Presents The Bible, which I bought last month). Hopefully, they will be good reads without the television series. The other thing I do in when traveling for business: Retire to my room early to read. So which of the books above do you think I dived into first? Answer tomorrow. As you might remember, I bought this book in August at LibraryCon. You know, I like to support self-published authors whom I find sitting at tables at conventions and in the library from time to time, but when it comes time to reading the books, I tend to be a little reluctant. A couple of the self-published efforts I’ve tried have been a little lackluster (ahem), and I’ve put them back on the to-read shelves. And I picked up this one. Well. This was pretty good. It’s an urban fantasy book featuring a protagonist wizard, the child of great wizards who are also billionaire businesspeople. The book starts right after their murders, where the hero (Nate Temple, for whom the series is named) owns a book store but might have to take control of his parents’ company. He specializes in finding esoteric works, and he’s commissioned to find a book that is drawing a lot of interest all of a sudden. It’s tied to dragons, creatures who generally remain hidden from public view, and Temple finds himself, his friends, and a growing circle of other Freaks working to prevent a power-hungry dragon from seizing power during a solar eclipse. It’s set in St. Louis, but it doesn’t ride that too hard (you won’t be able to, say, drive a cab based on the text). It has a couple of place names, but that’s mostly it. Not even as much as an Anita Blake novel. Well, an early one, anyway, as I abandoned that series, what, twenty years ago? You know, I liked it better than the Jim Butcher book I read a couple years ago. Of course, as this is the first of the series, it’s fresh and setting up the urban fantasy world and the team I presume will appear in later books of the series. Which might get as bogged down in Series Business as any series does. But this is the first, so it is without that baggage. Perhaps I should stick with only the first book or two of a series to keep that freshness. 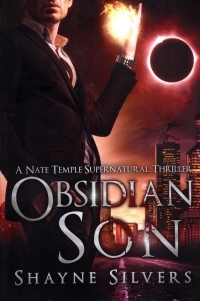 At any rate, worth a look if you’re into urban fantasy. I’ll probably pick a copy up for my nephew, so that will be two copies of this book I will have bought…. boughten? What verb tense is that? I did, however, move it to the proper place since the volunteers didn’t recognize it. 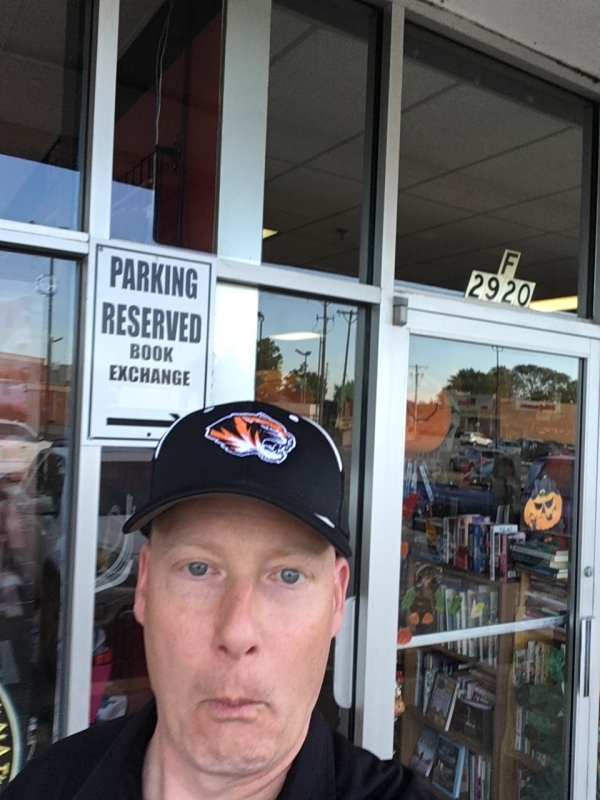 So we took the semiannual pilgrimage to Ozark to pick out books from the side room of the Christian County Library. We got there at a little after six, but it was not crowded–dealers were not out in force scanning every book in the joint to find something profitable, which could well mean that the book market is cratering. How would I know? It is not for me. At any rate, the boys found a stack of books and delighted everyone by continually proclaiming how many they found, and that the children’s books were only fifty cents. Their selections are not depicted in the image below, again, as they made off with them immediately. Two history courses from The Teaching Company probably for three dollars each: A Brief History of the World and The African Experience: From “Lucy” to Mandela. My oldest son asked me why Africa had an experience instead of the history. Ah, the things one knows but cannot explain logically. 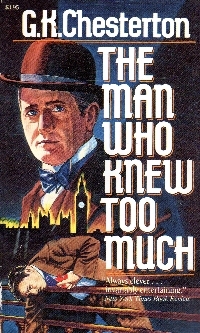 Mr. Monk Goes to Hawaii, a paperback based on the television series. I think I have another one around here somewhere for when I go on a kick. Or find them. James Wesley, Rawles’ Founders, a novel. I was afraid I’d recently bought this, but I bought How to Survive the End of the World as We Know It in Hot Springs this summer. So when I go on a kick or can find them. Unbroken, the story of Louis Zamperini as told by the woman who wrote Seabiscuit. This is a nice hardback copy, but I thought I’d recently bought this book. But I did not: instead, I picked up a paperback copy of The Devil At My Heels, Zamperini’s autobiography. So I can read them back to back if I go on a kick. Or can find them. A copy of Ulysses Grant’s memoirs (and selected letters). Gentle reader, the most expensive books I own are probably the first edition two volume set of U.S. Grant’s memoirs that I inherited from my wife’s uncle. I was seriously just recently thinking I want a reading copy of these books so I don’t get Doritos dust in the first editions, and here they are. It’s crazy how you sometimes find what you’re looking for. Lassie, Come Home. I might or might not have a copy of this already–I think I have a worn copy that fell to the children, not that they read any of the books about dogs or horses that I received but did not read in my youth. At any rate, I’ll read this juvenile classic at some point to pad my annual numbers. A Christian Manifesto by Francis Schaeffer which I bought because I remember that I read Escape from Reason eleven years ago. Although until I read my own book report on it, I did not remember the actual content of the book. This volume’s title is probably more meaningful. The Devil Wins, another crack at Jesse Stone by Reed Farrel Coleman. I almost put this down several times because I was not pleased with his first try. A Thomas Kinkade Cape Light Christmas book whose title is so meaningful that it’s covered by the library sticker on the spine. The title is actually A Christmas Promise. I’ve already read a Cape Light Christmas book: All Is Bright by the co-author of this book. I’ve been stockpiling Christmas books this year, so perhaps I’ll read more than one at Christmas time. Rabbit, Run by John Irving. I haven’t read any Irving that I recall (Well, Washington Irving, but that’s a way different guy. This is the first of the Rabbit series, so I might as well start here. The Lost Books of the Bible which goes right into my recent reading on the same. How to Restore a Farm Tractor. I’ve been thinking about doing this, maybe. I must be downwind from Republic’s annual old machine festival Steam-O-Rama or something. Of course, I don’t have the time to take care of needed maintenance on Nogglestead, so I don’t know when I’d fit working on this new hobby of my daydreams. I don’t even know how long it will be until I read the book. Mysteries of the Bible, a Reader’s Digest book akin to Mysteries of the Unexplained. Probably short anecdotes that aren’t actual Bible scholarship, but starting points for inquiries. Trash to Treasure. I’ve read a couple in this series (2, 6, and 8, but not in that order) back in my crafty days. Perhaps this will jump start me into doing projects again and clear some of the raw material from my garage. Or perhaps I’ll need to clean out my garage first so I can get to the raw material. My beautiful wife almost got a stack as tall as mine, but not quite Try harder next time, my dear. At any rate, it was a fun little jaunt, and you know, I rather enjoy writing these posts and wandering a bit down memory lane recalling books I’ve bought before and sometimes even read. So unfortunately, gentle reader, these self-indulgent posts will continue. I got this book at a later time than the Korea guide books (The New Pearl of the Orient, Bomun Temple in Seoul Korea, and Wonderful Korea, but I kind of thought of them as a genre and similar; however, this volume is relatively recent (post 2002). So it refers to the 2008 Olympics, which is jarring. At any rate, it’s an interesting browse. 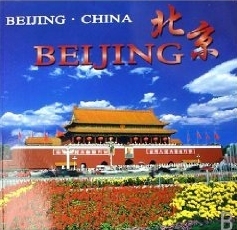 The photos are good, with just a hint of lauding the State in some of the building selections, but it does not completely overlook the historical or religious sites of Beijing. As I just bought a book on Rococo style, I can’t help but compare Chinese/Oriental interior design principles to the couple of things I looked at in that book before I bought it. Were I Lileks or Driscoll, I could probably write intelligently about it. Maybe some day, after many Sunday afternoons watching football games with architecture and design books on my lap. Should the NFL last that long. Worth the buck or two if you can find it. I know you’re wondering, “Brian J., did you and your beautiful wife actually drive 58 miles to go to a book sale?” Yes, gentle reader, we did. She spotted the book sale somewhere, and we decided to make an afternoon date of it. So we ate some lunch at Da Vinci’s , which might be the best Italian restaurant in Lebanon, but we have no way of really knowing as we’ve only eaten at one place in Lebanon. And we found the back room of the Lebanon-Laclede County Library, where they hold the semi-annual sale. It was weird: The books were on shelves, not on tables. Somehow, that just made it feel very odd for us. Browsing books on a table is kind of ergonomic; they’re generally the same height, and you can scan the titles quickly. When they’re on shelves, you have to stoop and reach and whatnot. “But, Brian J., isn’t that just like the used book stores you like to frequent?” Well, yes, but my browsing at used book stores tends to be a little more selective, and my purchases a little more limited. As it was this Friday. A Tree Grows in Brooklyn. Wait, didn’t I already read that just this year? Can I have forgotten it already? No, this is the Reader’s Digest World’s Best Reading edition, and I collect those. So I had to spend the dollar to get it. As a bonus: I can put it with the others of its type on my read shelves automatically without having to read it again! True at First Light by Hemingway. The First Man by Camus. Pop Art and Rococo: A Style of Fantasy, a couple of art books on styles I’m not overly familiar with. One day, some day, I might sound as smart as Lileks or Driscoll. The Tao of Meow, which sounds like it might be a Taoist book about cats, but it looks to be a collection of humorous verse akin to I Could Pee On This And Other Poems By Cats. History of China which looks to be less an in-depth history than a history and picture book like the Time-Life series. My beautiful wife got a stack of magazines, a number of Daniel Silva suspense novels, and a cat puzzle that our nine-year-old has already halfway completed on the very table where I took the photo. 3 by Earth Wind and Fire. The Wiz original cast recording. The record pickings were limited to two boxes. 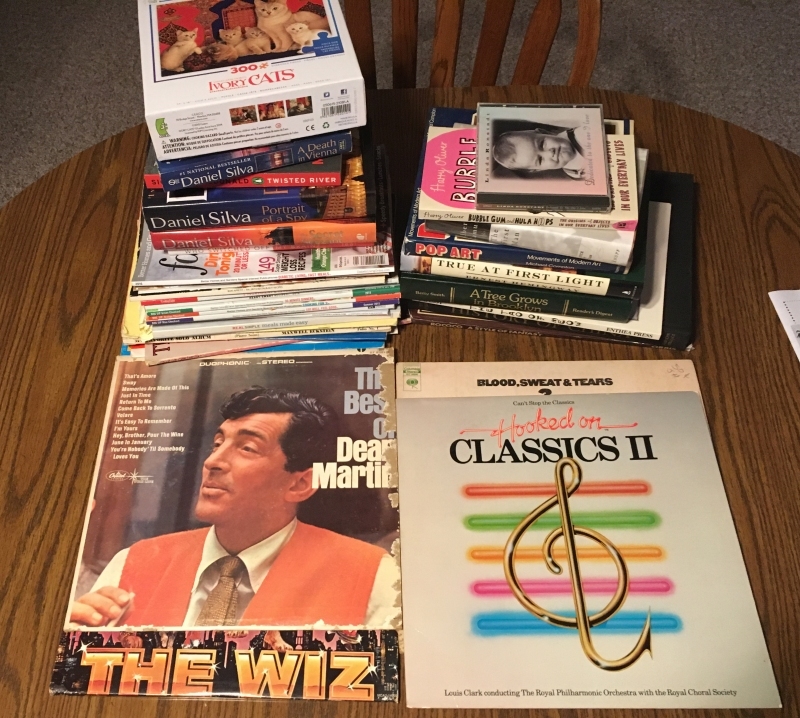 I suspect I’ll get more at the big Friends of the Springfield-Greene County Library book sale in a couple of weeks, but even then, the days of buying tens of records is probably at an end. I’m getting a little more selective in my purchases, as I’ve bought most of what I know I like by now. But then again, they might have a stack of pop records from Italy in the 1970s, and I’ll want them all. Note, gentle reader, that this is not the furthest we’ve gone round trip for a book sale. Ten years ago, we went sixty-five miles round trip from Old Trees, Missouri, to Greenville, Illinois. To think, I am still buying books. There was some confusion in at Nogglestead as the provenance of this song. My beautiful wife thought it was on the Highlander soundtrack. I knew it was on the Iron Eagle soundtrack because some almost thirty years ago, a friend of mine played the song to pump herself up for softball games. I thought perhaps Queen double-dipped and that it was on both soundtracks, but that is not the case. 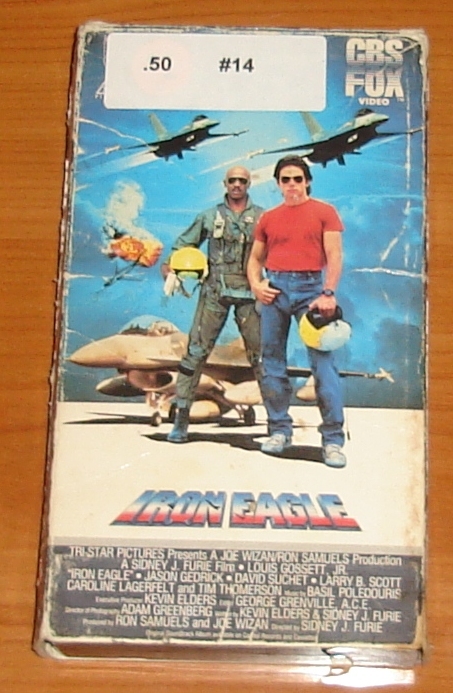 It is on the Iron Eagle soundtrack. But! It is on the Queen album A Kind of Magic which also features a number of songs from the Highlander soundtrack. But that is not the case. According to the Wikipedia entry for the song, Freddie was just goofing around. Also, note: This is not the only Queen song on my gym playlist. But that is a post for another day if I remember it.